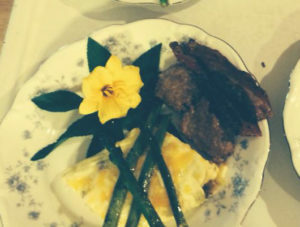 Lucky guests at the Timmermann House Bed & Breakfast in Aviston, Illinois, are treated to a full breakfast each morning, featuring a delicious hot entree. This easy egg dish is a favorite. Preheat oven to 350˚. Line 8” x 10” shallow pan with parchment paper, allowing a 2-inch overlap on all sides. Spray parchment with pan coating. Place eggs, milk, mayonnaise, and flour in blender. Blend for two minutes. Pour mixture into pan. Sprinkle with one-half of the cheese and any additional fillings. Bake for 10-12 minutes or until set. Remove from oven and roll up like a jelly roll. Sprinkle with remaining cheese and place back in oven just until cheese is melted. This entry was posted in Food & Drink, Local Businesses, Lodging, Recipes and tagged Clinton County business, Clinton County Recipe by admin. Bookmark the permalink.